Free Instant Ink Special | A Savings WOW! As much as I try to be paperless, I still find myself printing out quite a bit of things. From printable coupons, homework assignments, greeting cards, and personalized gifts, one thing I look for is a way to save money on printer ink without sacrificing the quality of the prints. My new favorite way to save money on ink is the HP Instant Ink Program! Have you ever found yourself having to make an emergency run for ink cartridges in the middle of printing out something for your child’s school project or for a business presentation? You’re not alone – I have had to do this before also! The HP Instant Ink Program is our lifesaver! – Occasional printing – $2.99 per month for 50 pages per month included, each additional set of 15 pages is just $1.00, plus you are able to roll over up to 50 unused pages per month. – Moderate printing – $4.99 per month for 100 pages per month included, each additional set of 20 pages is just $1.00, plus you are able to roll over up to 100 unused pages per month. – Frequent printing – $9.99 per month for 300 pages per month included, each additional set of 25 pages is just $1.00, plus you are able to roll over up to 300 unused pages per month. Your cost is the same whether you print high quality photos or text. You can easily change your plans online if you find that you are using more or less than your current plan. There’s no annual fee and you can change or cancel your plan anytime! Once you sign up for the program, you’ll be sent special HP Instant Ink cartridges, which have more than the XL cartridges, so you’ll replace them less often. You won’t be charged until after you insert your first HP Instant Ink cartridge. 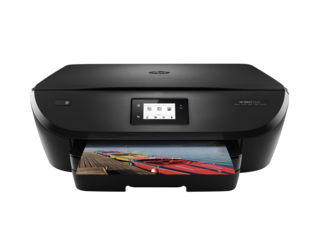 The best part – your printer will tell HP when to send more ink and you’ll get the ink before you need it! No more running out to the store or waiting until your online order arrives to get your ink! to get 6 months of free HP Instant Ink. Of all of the printers I’ve owned, this printer was by far the easiest to set up. The manual and setup screen walks you through everything. I didn’t even have to set up the wireless wi-fi connection. It automatically did that for me. It told me when to go on my computer or phone to download the printer drivers and set up the HP Instant Ink Program. I was up and running in less than 20 minutes. The quality of the prints are very good, both in black and white and in color. There are also a variety of printables that you can access from the printer itself and it’s very handy to be able to print them out without having to go on your computer. You can download the free HP Printables app on your phone to view, print, and schedule out the printables. Download the free HP ePrint app on your phone and you’re able to print from your phone at home, at work, or on-the-go. You can assign an HP ePrint email address to your printer or use the default one assigned to easily email documents to the printer. One way I plan to use my HP Envy 5540 printer is to make personalized photo candles. Check out my tutorial here to start making your own personalized gifts! I’ll share more projects as I continue to play with my printer!